In 1986 in Dragon Magazine I saw an advertisement for a new space game called Traveller 2300. I was hooked immediately- I had messed around with Traveller, the High Space Opera RPG that had been for around for a few years, but since I had little experience with classic space opera it was more of a curiosity. But a hard Scifi space RPG was much more up my alley. I was really into it for a few years, but could never get a game off the ground. partially because this was a period of fracturing in the RPG scene (everyone was coming out with a new game setting and rules set- so it was hard to find 4 people who were all investing in the same game. 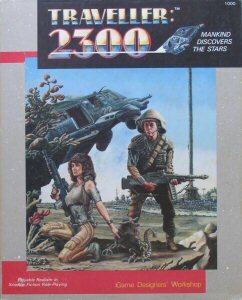 But also, sadly the rules for Traveller 2300 were beyond me. But one important thing was that the game was set in a fairly factual universe. They had taken real and current data about the stars within a 50 LY radius of the solar system, and used that as the basis for the game universe. They had figured out 300 years of future history, colonial expansion from earth, wars, trade routes, and even points in space where humans contacted alien neighbors- all in a spherical chunk of space with earth at the center. the poster map that came with the boxed set of Traveller 2300 with its explanation of the 3D space it was showing was probably my favorite thing about the game. It showed a 'top down' view of the 'sphere of space', and then explained the formula of how to find the distance between any two stars. 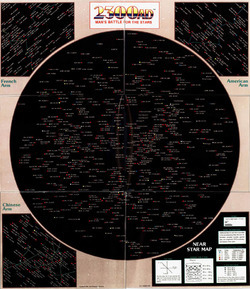 All the star's names were shown, and then also their position in the main sequence was indicated by their dot color. To show how "deep" each star was in the map, each star's dot size would vary to indicate its Z axis position. (the bigger the dot the closer the star was to the viewer). So the first issue with this map was the confusion between the size of the dot verses the size of the star. since they were using the color of the dot to indicate the color of the star, then it seems intuitive that the size of the dot indicated the size of the star, not its 'distance' from the viewer. Perhaps if the background behind the stars had shown a curve of the inside of a holograph sphere, it might have helped. The Key was not much help. It gave the formula for calculating the distance between stars, but the dot size only indicated an approximatedistance range of 20 LY, which is not very precise. (they gave the exact positions in a booklet, but that reinforced the idea that this was more of a decorative map then a functional one. Beyond that, there was the fact that the setting had an imposed rule that no ship could safely go more then 7.7 LY before the crew got a lethal dose of radiation. This was a side effect of the game's FTL Stutterwarp drive. What this meant was that ships could only travel in short jumps, and then spend a few days in orbit around a gravitational body discharging the dangerous radiation. So it was pretty much impossible for a character to travel directly between 2 stars, but instead they followed established routes between stars of the required distance or less. These were grouped into 'arms' and 'branches' and were named after the political powers that had colonized them the most. 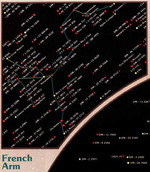 The other three corners of the map showed each of the main arms, on a version of the map, with lines drawn between the systems, to indicate which stars were connected to what other stars to form that segment of the arm. This was still from the 'top down' view of the sphere of space, so the segments of the routes were visually squashed. Also, each of the arms was shown on its own, so there was no easy way to see where one arm connected with another arm, or how close a particular star was to the edge of the sphere of known space. So as you can see I was presented with an interesting geography, but it was being shown to me in a rather frustrating format. Of course, depicting 3D geography on a 2D surface is always a challenge- just look at the distortions one adapts to on the various projection system for maps of the earth's surface onto a flat map. But I still focused on trying to solve it- my first realization was a map could not solve every situation's needs. There was always a compromised of some sort, because a flat map can't hold all the information of a 3D space in a visually intuitive way. So I eventually decided what I really was looking for from the map was a tool to help my player's caption character be able to navigate through this universe. He needed to know where he could go when he was anywhere on the map in a simple manner. I never really found a solution I was happy with. (the subway map worked very well, but upon reflection, I felt it took away some of the 'scifi' feeling of navigating among the stars. There was something to the action of calculating your location, and flying your ship true to a line that would take you to your destination. Part of the feel of the game was his kind of mechanical and gritty feel to space. That was when I got to thinking about angles, and how a starship navigator would have to know how to orient their ship to where they want to go- before engaging the ships engines. And the old XYZ coordinates were not really useful for that. They were useful for someone one the Outside looking at where each object in the coordinate system was located in relation to the origin. But if I am on a ship out somewhere in deep space, what I would really want to know was where the other stars were in relation to me- I would need to find a point of reference (the center of the Milky Way I figured) and then know how many degrees latitude and longitudinally from that point I need to turn the ship to be pointed at where I wanted to go. So I envisioned a 2D map that was a circle, and the ship would be at the center. then the circle was marked in degrees, with 0 degrees being pointed at the galaxy center. so that would handle the 'longitude', and their 'latitude' above of below the plane could be indicated by degrees inclination of declination. The main advantage of this map system was that 1) it looked very cool, and sci-fi. and 2) looking at the map the distance from the center to any of the other stars shown was its true distance- you could see visually which one was the closest to you without any math. I remember telling my dad about this, with the excitement of someone who had made a profound discovery. He replied "Son, you just reinvented the Polar Coordinates system." Ah. When I was in design school, working on a thesis project, I knew I wanted to do something in Director, (this was back when Flash was just used for spiffy animations- director had the serious interactivity scripting language.) and I dusted off this old map problem. I had done all the maps, and figured out the calculations- even building an excel tool, to allow me to make the angular calculations for every star system. I did my these project on creating a clickable map tool- where someone could see each map rendered for any star system, and click to jump to the next, and the next after that, and so on.